Church Street Majolica Works - In 1877, Thomas Forester commenced business at a small manufactory in High Street; and as his business rapidly increased, he took additional premises in Church Street. 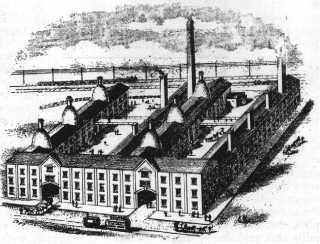 These he shortly afterwards took down, and built upon their site a new manufactory – the Phoenix Works – which he completed in 1879. A trade advertisement of the 1881-2 period is reproduced in Plate 55. In the beginning of 1883, Thomas Forester took his sons into partnership and the business was carried on under the style of Forester & Sons. Upwards of four hundred hands were employed. The quality of' Messrs. Forester's majolica was remarkably firm and good in body, the colouring well managed and the glaze very satisfactory, as was the modelling of the floral decorations. Messrs. Thomas Forester & Sons (Ltd.) continued to 1959. The basic marks incorporate the Phoenix and the initials T.F. & S. Ltd.